Many of our readers know Fr. Tim Ferguson from his days as a parishioner at St. Josaphat and in his former role as a Canon Lawyer for the Archdiocese of Detroit. He was recently ordained to the priesthood for the Diocese of Marquette, Michigan. His first Holy Mass after ordination was in the Extraordinary Form, with at least two metro Detroiters in attendance. Fr. Tim will return to St. Josaphat next Sunday, June 21, to celebrate the 9:30 AM Tridentine Mass. 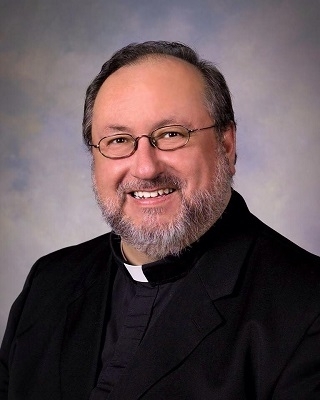 He has been assigned to St. Peter Cathedral in Marquette, which perhaps not so coincidentally was the site of Extraordinary Form Masses formerly celebrated by current Oakland County Latin Mass Association Chaplain and fellow Canon Lawyer Msgr. Ronald Browne. An astute reader reported some good news concerning the new Newman Center in Lincoln, Nebraska, a new church constructed in the traditional style which was featured in our May 31 column. 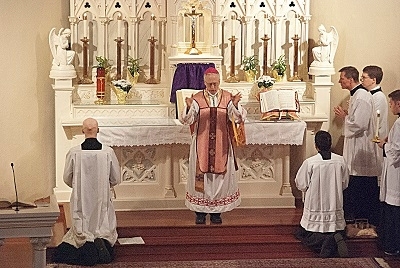 The very day before, on May 30, 2015, the Newman Center hosted its first Holy Mass in the Extraordinary Form, an ordination Mass for the Priestly Fraternity of St. Peter. 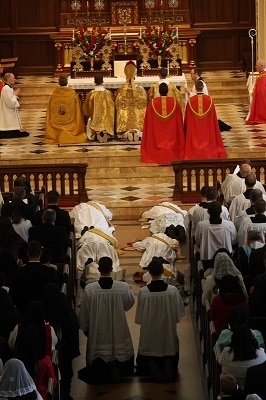 Bishop James Conley ordained six priests there, a most fitting choice considering that the previous site for FSSP ordinations, the Cathedral of the Diocese of Lincoln, has often been noted for being too modern architecturally for such ceremonies. 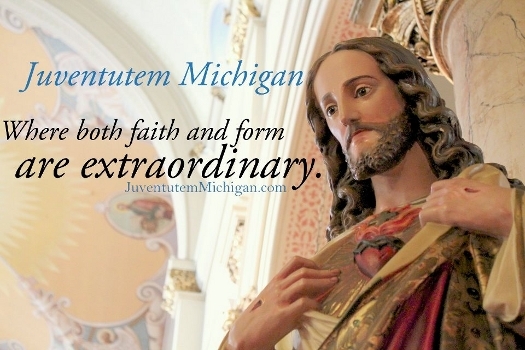 A reminder for those who have not yet heard: The Oakland County Latin Mass Association has been granted permission to have the Sacrament of Confirmation in the Extraordinary Form administered to those who express a desire and are prepared. Confirmations will take place at the 9:45 AM Mass on Sunday, November 8, 2015 at the Chapel of the Academy of the Sacred Heart in Bloomfield Hills. His Excellency Donald F. Hanchon, Auxiliary Bishop of the Archdiocese of Detroit, will administer the Sacrament. Those with an interest are urged to speak with Chaplain Msgr. Ronald Browne promptly, or to contact us via e-mail at: info@oclma.org. Since there are few occasions to receive this Sacrament in the Extraordinary Form, candidates from the entire Detroit metropolitan area are invited to apply. A reader suggested that we make known the fact that the Sacrament of Confession is available six days per week, for many hours of the day, at Detroit’s [Fr.] Solanus Casey Center. Also known as the Capuchin Monastery of St. Bonaventure, the Solanus Center is regarded as the “Starbucks of Confessions” for its convenience. It’s not a secret; there is almost always a (short) line of penitents waiting, no matter the day or time. Visitors also have the opportunity to pray at the tomb of Fr. Solanus. Confessions are heard Monday through Saturday on the hour at 10:00 AM, 11:00, 12:00 Noon, 2:00 PM, 3:00, and 4:00. The priest remains until all Confessions have been heard. There are two confessionals; a second priest helps out when the line gets long. It is worth mentioning that the Confessions are heard without hurry, and absolution is given in proper (Ordinary) form. The Solanus Center is located at 1780 Mt. Elliott St. at Kercheval, approximately one mile north of Jefferson. Guarded parking is available in the lot on the north side of the property, with the vehicle entrance off Kercheval. A little-known fact about St. Bonaventure’s is that there is a hidden chapel, located behind the now-unusable High Altar of the modernized main chapel, which, unlike that main chapel, is fairly traditionally arranged, including its own High Altar.